Approximately 30 members of Boston Students for Justice in Palestine protested the Israel Indie Freedom Fest Sunday afternoon. The celebration was held by Boston University Hillel and BU Students for Israel at the BU Beach as a part of Israel Peace Week. The protest started at approximately 3:30 p.m. and ended around 5 p.m., and it took place at the BU Beach and Marsh Plaza. Protesters chanted slogans and carried banners that criticized Israel and actions related to Israel Independence Day. As the protest was underway, festival attendees were gathering in the midst of DJ song mixes, sprinkles of color powder and even a visit from a camel. Protesters, however, kept chanting as “HaTikvah,” the Israel national anthem, played. Ibraheem Samirah, a member of the BU SJP and one of the protesters, said the celebration used “fun things to cover up very horrible, terrible crimes against humanity,” and he claimed that the festival is offensive to Palestinians. Samirah said he was one of the students who were removed from the BU Hillel gathering “All Students, All Israel Think Tank” on Jan. 28, and the incident partially led to the protest. Amid the protests, BU Hillel Director of Student Life Ethan Sobel said the Israeli community was celebrating its independence and is rejoicing. Passing by the protesters in front of Marsh Plaza, Jake Bloomfeld, a freshman in the College of Arts and Sciences, said he was perplexed by the ongoing chants and hoisted banners. Members of the protest provided The Daily Free Press with a pamphlet entitled “Is Boston University Hillel Islamophobic?” which claims that BU Hillel backs Islamophobic beliefs. “One of several prime examples of BU Hillel’s Islamophobic connection is vis a vis … [Committee for Accuracy on Middle East Reporting], a known Islamophobic organization … that plans events through [BU’s] campus,” the pamphlet stated, citing a report by the Council on American-Islamic Relations. Taking cognizance of BU Hillel’s connection to CAMERA, Samirah said the Israel Indie Festival is embedded with Islamophobia and covers up the Palestinian people’s struggles. 1. You spell your source’s name wrong. You are referring to Ibraheem Sumaira, not Ibraheem Sumirah. That’s just bad journalism. 2. This protest was a direct attack against BU Hillel and BU Students for Israel, having little to do with Israel itself and the conflict. This is shown by the fact that the organizations being protested (as shown in the picture) are only being protested because they are on the event’s Facebook page. Some organizations being protested, including The David Project, weren’t even present at the event. And so, they were only being protested because of their link to BU Hillel and BU Students for Israel. If you want to protest BU Hillel and BU Students for Israel, just protest them. Why bring the Israel-Palestinian conflict into it? 3. (This one’s more for the protesters than the authors) Dialogue is encouraged by BU Hillel and BU Students for Israel, so why not have a dialogue with them instead of protesting events, making attendees feel targeted and uncomfortable? Do you know where they can’t have 1-on-1 dialogue? Palestine. Sitting in a first world country to eat hummus and talk it out doesn’t do anything for Palestinians. Your attempts of cleaning the occupation’s image DO HAVE consequences. They translate into first world country money spent on bullets. Do you feel uncomfortable and targeted? Aww I’m sorry.. Must be so awful, let me ask some kids in Gaza what they think about your hurt feelings, neocoloniser. The end logic of “neocoloniser” is that Israel is a colonial power, and must leave. So when you say Palestine, I’m guessing you mean “from the river to the sea”. Very true. Freedom of speech is not a privilege for Palestinians living under Palestinian Authority rule. Criticizing the PA could get you killed, or at the very least executed. Same goes for Palestinians living under Hamas control – criticizing the Hamas publicly would get you labeled as a “collaborator” and again – you’ll be executed. This is not much different than how most Arab countries run their affairs. You know where Palestinians DO have freedom of speech? IN ISRAEL!!!!!!!!!!!!!!! 20% of Israeli society is Arab/Muslim. These Arabs, some of which consider themselves “Palestinian”, serve on the Israeli Parliament. There, they criticize Israel left and right (and no one kills them). 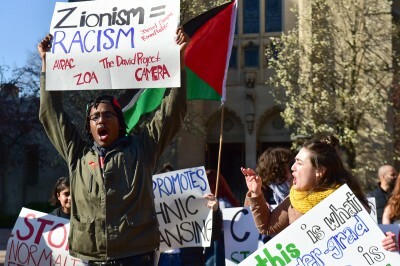 Jacob Hertz – if you think your absurd protests, BDS, Apartheid week, and all other nonsense on college campuses, do anything for the Palestinians you are sooooooo offfffff. In fact, sometimes you do more to hurt them than help them. BDS caused Soda Stream to move its factory from Judea and Samaria which caused 100’s of Palestinians to lose their jobs. So next time you wanna talk about privileged students who think they know what’s good for the world…. Look in the mirror! Lol “Muhammad Jafar” is obviously a zionist disguising his name to make the issue seem unbiased. Seriously, don’t you people have anything better to do? Chanting and harassing students on an American college campus doesn’t do anything for Palestinians either. You know where they can’t have 1-on-1 dialogue? PA- and Hamas-controlled Palestine. Meanwhile, in Israel proper, civil debate is free. what a SHAME that BU is hosting events co-sponsored by organizations like CAMERA. It is not a matter of debate whether or not CAMERA is an islamophobic and racist organisation. Perhaps Hillel and BU need to arm themselves with some fact checking before inviting such groups on campus. Your story lacks full accuracy … They actually as they are always prone to do prevented others from celebrating what they want to celebrate and wreaked havoc with he festival ! That’s what people do when their is no legitimacy to what they are doing or saying . Where is the other side here in this story !? I feel it’s rather biased and one sided of course as usual…. I don’t see them at cultural events for Malaysia, or China, or Egypt, all of which have ABYSMAL human rights records. Just the Jewish country. You are welcome to start protesting them. Just because there are worst thing happening doesn’t mean this is good, and fyi most of these students are active in protesting injustices from Flint, blood minerals in Congo, labor conditions in India, and Saudi Arabia-Iran repression, to police brutality, Russian State crackdown on LGBTQ+ communities, Latin American machismo and Gentrification in the very city of Boston. So sit down and check your sources before making accusations. You are defending a bad system, war criminals, and you should feel bad. If I were part of a group that calls black people who don’t agree with them “Uncle Toms”, I WOULD feel bad. That one, however, is on you. 1. This event was inherently political not cultural in nature. One nation’s independence is another nation’s catastrophe. 2. Whether or not students protest one cause does not mean that they necessarily have to protest another one, but in this contest it seems you are invoking that they are only protesting Israel because it is a Jewish state, which is to say that these students are anti-semitic. Like Joost mentioned, at least in so far as SJP members are concerned, these students are protesting many other regimes and many other causes, so this derailing needs to be taken elsewhere. No other state is subject to this much delegitimization. No other state is said to be fundamentally rooted in racism. No other state (as opposed to government; SJP people think that all Israelis are complicit) is continuously vilified by international conferences, student protestors and the media. Stop pretending it’s all the same. How exactly? The event wasn’t about policy at all. You could say the same thing about July 4 celebrations in America, which celebrate the founding of a nation that would conquer a continent, or any cultural celebrations in Britain, which once ruled a quarter of the world’s population. Meanwhile, Fatah, the main political party in the West Bank, celebrated its 50th anniversary a few years back – not of its founding but of its first murder of Israeli civilians. Hamas, for its part, calls for not just the destruction of the state of Israel but the murder of all Jews everywhere. their Iranian backers frequently call for the total annihilation of Israel. In Israel, Independence Day celebrations are about the nascent state survival in the face of an invasion by all its neighbors intended to annihilate it completely. The Israeli public remains supportive of a two state solution – more than can be said for most Palestinians. The “Nakba” as they call it resulted in a sharp decline in the Palestinian population of a portion of their homeland. Palestinians who stayed have full rights in Israel. The Palestinians have on numerous occasions been offered independence in the rest of their homeland. Meanwhile, Jordan is 70% Palestinian but ruled by a Hashemite dynasty. In Lebanon, Palestinians are kept in squalid camps by law and are kept from gaining citizenship. In Syria, Palestinians have been starved by various warring factions. Why is Israel the bug enemy? As for your point about SJP, the organization is committed to the destruction of the state of Israel. They may protest other governments but the Israeli people are the only ones they condemn as irreparably racist and generally evil. Meanwhile, SJP nuts ignore the intense hatred of Jews deeply entrenched in Palestinian society. Palestinians are the most anti-Semitic people on the planet, quite literally, actually, though not too far ahead of the rest of the Arab world (http://global100.adl.org). If you make the argument that all people deserve human rights, it actually does. I believe ‘A’ is unjust. What is the critical difference? We see through your sham human rights campaign. Israel is they only state they believe deserves annihilation, plain and simple. Israel has by far the best human rights record in the Middle East. Israeli policy certainly isn’t perfect, but consider what is going on in other countries in the region with minority groups: Syria has fallen apart entirely; Lebanon’s government is largely non-functioning; Kurds are denied political rights in Turkey and Iran; Iraq is witnessing Iran-backed Shia militias duking it out with the Sunni jihadists of the Islamic State, with the Kurds carving out their own corner of the country; Bahrain is majority Shia but ruled by a Sunni monarchy; Sunni Saudi Arabia recently executed a prominent Shia cleric on what seem to be trumped up charges; and Libya is mired in a Civil War between tribal groups with jihadists mixed in. Why is Israel singled out. As if that isn’t damning enough, consider what is happening to Palestinians in neighboring countries: Jordan recently stripped citizenship from many Palestinians; in Syria, many Palestinians are suffering under sieges and Islamic State rule; in Lebanon, they are denied citizenship so as not to upset the country’s delicate confessional balance and are forced to live in squalor by law; and Egypt has very few Palestinian residents, but only because refugees of Israel’s War of Independence who fled to Egypt were all stuffed into Gaza. This whole SJP/BUSI thing really so stupid. I am pro palestine and I do condemn everything that the Israeli government has done to the Palestinians, but to constantly disrupt BUSI events isn’t going to solve anything. In the end, these political groups are there to incite an even further divide on campus. You can never convince pro Israeli students they’re supporting fascism and apartheid because they refuse to believe it. They’re CHOOSING to be ignorant and they will never change their minds about it so just LET THEM BE. The only thing SJP has done to help people in need is the refugee clothes drive. Why can’t they focus on doing more to serve Palestinians directly instead of causing trouble on campus for their own selfish satisfaction? Congratulations. You ruined another event. Palestinians are still occupied and getting murdered. You get a pat on the back. It’s also terrible PR. They look petty doing this (and thank you for the insight). the point is not to convince pro-israel students anything. Each is entitled to their opinion. The point is that there is clear propaganda at events like this, and the complete erasure of Palestinian history, that cannot go uncontested. How do you think the Palestinian students feel about an event called Israeli independence celebration which to them signifies the expulsion, death and displacement of their families? During the right of education event, a Palestinian student talked about her experience trying to get to college, as a college student like yourself, to school. The hurdles she had to jump through were unimaginable. When asked what students here can do to help, she said they can help influence the United States foreign policy by raising awareness. This is raising awareness and making sure that at least propaganda does not go unchecked or uncontested. This has been the function of protests for all of history. Yes, clothes drives help people perhaps directly, but when our American tax dollars are going towards the suffering of a peoples, then raising awareness amongst the privileged who get to go to college is an imperative. By the way as a “pro-palestine” student I would like you to know that I am vehemently anti-Hamas. Maybe you can get over that now. Yet a late August survey of Palestinians found that 94% were “satisfied with Hamas’s military performance,” 78% were “satisfied with its defense of civilians in Gaza” – this despite their open acknowledgement of use of human shields – and 89% were “satisfied with its media and communication performance,” which consisted of anti-Israel propaganda, including huge inflation of civilian casualty numbers. I hate the Israelis, and I hate the Palestinians. I’m sick of this stupid squabble. But if I had to choose to wipe one from the face of the Earth, it would be the latter. At least the Semites have the cunning to take control of Western media. “Viva Palestina” is perhaps the dimmest expression I’ve ever heard. Palestine doesn’t even exist. You realize that “Semitic” means nothing more than a language group which includes both Hebrew and Arabic? And states only exist because enough people agree that they do. The U.S. didn’t exist at one point; nor did Germany, Ukraine, Ireland, you name it. So what exactly is your point? This comment is absolute racist, bigoted trash. You are anti-Palestinian/Arab and you are also a raging anti-semite. Get out of here paddling that racist, anti-semitic crap about how “semites have the cunning to take control of western media”. Damn man, we have some seriously scary white supremacists in this country. Also, does the FREEP not check comments for hate speech? I’m pretty sure wiping people “from the face of the earth” is genocidal. Disgusting. Do they pay you by post, or by hour? The shilling in this rag of a paper is amazing, from both the globalist-brainwashed writers to the sheep-like commenters. I live in the United States. I don’t want the mess going on in the Middle East to become any more of a headache for me than it already is. Can’t they just kill each other without whiny little children making it their holy mission to “raise awareness” while doing f-all? The only thing worse than an Israeli or a Palestinian is a lovechild between the two. I’m 90% sure “Ben Garrison” is a troll. An article like this shows exactly the need of CAMERA and similar organizations who are dedicated to “accuracy in reporting”. Before you trust everything you read online it is so important to know your facts. CAMERA monitors and corrects news that is inaccurate no matter who is the one in the wrong. As long as you continue to see groups and individuals who work for honesty and progress as the enemy nothing will be changed. Thank you CAMERA for what you do and great work BU Hillel for spreading the conversations needed about the realities in Israel and the rest of the Middle East. I read CAMERA bulletins all the time, and thee’s really nothing about them that’s antisemitic. What they do is fact check and ensure journalists report the story fairly. Organizations like the NYT, WSJ, WaPo, LAT, Reuters, etc. frequently issue corrections based on CAMERA’s work. But leave it to SJP to call the fact-checkers Islamophobic. Here’s an idea: create solutions instead of assailing other students in just about the pettiest way possible. There is no way CAMERA is Islamophobic. The organization works so hard to help eliminate anti-Semitic media coverage and news stories. To call their actions Islamophobic only demonstrates the anti-Semitism prevalent at universities and among young people. It is evident that BU has a ton of anti-Jewish sentiment, and for this article to condemn as Islamophobic the few organizations BU actually works with and has on campus that aim to encourage dialogue and decimate anti-Semitism in the media is disgusting. In what world is CAMERA Islamaphobic? The entire purpose of the organization is to foster accuracy about Israeli-Palestinian affairs, and that’s a discourse that requires participation from both sides. Some of CAMERA’s great activists are people like Kasim Hafeez, a British-Pakistani Muslim who once flirted with the idea of joining a terrorist organization but has come to celebrate Israel and its modernity and acceptance of individuals from diverse backgrounds, and Bassem Eid, a Palestinian human rights activist. Shame on BU SJP for promoting this vitriol. My alma mater is an embarrassment. I respect peaceful protest, but the Saudi lobby continues to infiltrate American college campuses. Look beyond the froth of your latte! See that you’re being manipulated by under the table and see that you’re being stopped from fighting real oppression! To say CAMERA promotes Islamaphobia is in my opinion preposterous. In the past year alone, CAMERA has brought two prominent Muslim speakers to my campus, and has treated them with the utmost amount of respect. Being pro-Israel does not mean anti-Muslim at all. CAMERA has given me great resources to combat such a notion, and has actively promoted the peaceful coexistence between the Jewish and Muslim populations of Israel. At events sponsored by CAMERA on my school’s campus, we have had great dialogues between Jewish, Muslim and Christian students. Therefore, calling CAMERA an Islamophobic organization actively detracts from their efforts to promote peace and coexistence. Talk about the event and the squabble however you will, but at least get your facts right. CAMERA is not Islamophobic, and is a non-partisan organization. It– literally — has nothing to do with Islamophobia. So Dave…you get snookered by SJP, which is a front for CAIR, a proven Hamas front. Don’t bother looking it up, son. That would involve actual REPORTING. And you allow students to slander CAMERA without seeking a comment from same or reporting on what CAMERA actually does.